The Csonka Cigar Traveler is simply the world’s favorite. Undoubtedly, it’s the gold standard and everyone’s choice for transporting a perfect selection of 4 to 5 premium cigars, along with all of the important accessories. Created for the cigar enthusiast, who can travel it conveniently in many locations due to its compact size of only 1.7” x 4” x 8”, it’s the perfect golf bag humidor, automotive case, brief case companion and more. Csonka presents the first luxurious, high capacity line of modular travel humidors that are priced for every cigar smoker to own and enjoy. The tour of this impressive line begins with their soft, well-padded Napa exterior, available in classic black, gorgeous saddle tan, burgundy wine and new limited edition pewter grey. New for the Cigar Traveler is a classy, brass closure hasp system, to insure a proper close and tight seal. It is designed with a 100% steel case construction for superior strength and durability. Forget those cheap plastic boxes that always crack, and those overpriced wood ones that sooner (more than later) get scratched and lose their luster. These cases all have classic contemporary elegance that feel wonderful in your hand, guaranteeing pride given as gifts or when showing them off to fellow cigar devotes. 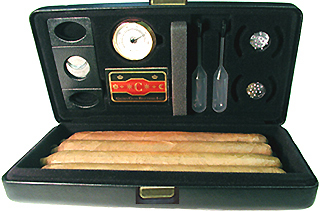 And now, Csonka Cigar Traveler "must-have" accessories are supplied and included inside. Enjoy a radial humidity gauge, a premium twin-blade stainless steel cigar cutter and two reservoir transfer pipette(s) to allow you to re-humidify on the go. All of these snap-fit into all Csonka cases' interiors (not attached outside like some afterthought as we've seen on others). The bottom line is maintaining humidity is easy and actually fun to do. When you see it and use it, you'll understand exactly what we mean. Access to your high quality cigars, and being right next to your needed accessories, is what separates Csonka cases from all others. As high quality cigar storage humidors, they look and they work better than anything else on the market today. When you consider its affordable price, the Csonka fully accessorized portable travel humidors, available in several sizes and styles, are easily the best value in luxurious, well-appointed high capacity cigar cases. Interior is high quality and the best portable humidor I've ever owned. The exterior started flaking immediately just from basic travel and handling. This is a great disappointment. Click the button below to add the Csonka Cigar Humidor Traveler / Burgundy Wine / Ceder Bottom / Accessories / GSTRA-WINE to your wish list.